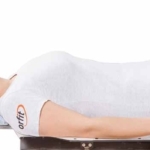 Orfit’s HP PRO Solution achieves a new level in patient immobilization. This immobilization device is designed for brain, head and neck treatments for both photon and proton therapy. It is the first immobilization device in the market that makes use of ultra-thin Nanor masks. The Orfit HP PRO Solution has been designed to meet the specific standards proton therapy demands. 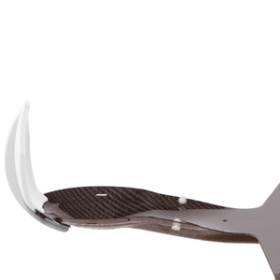 It includes a homogeneous low density immobilization device with a narrow carbon fibre base plate in the head and neck area, allowing for close range positions of the treatment device. The base plate is lightweight with good dosimetric properties. 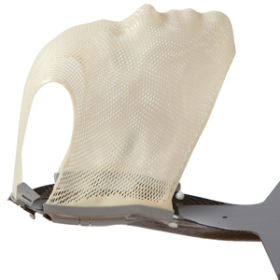 Orfit provides thermoplastic head masks and head, neck and shoulder masks, that are moulded over the patient and securely and easily fastened to the base plate. The thermoplastic masks result in a high precision immobilization. 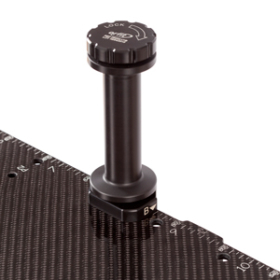 Comfort and stability are guaranteed by the use of Orfit’s Nanor thermoplastic material. Nanor is a thin thermoplastic material that makes use of nanotechnology to improve the mechanical properties of the thermoplastic material. The masks are unique thanks to their patented locking mechanism. The mask profile slides over a locking pin and then swivels towards the base plate until it clicks securely into the base plate. It is easily unlocked so that the mask can be removed quickly. To ensure that the head of the patient is correctly positioned, and prior to the moulding of the mask, a cranial back-stop is attached to the cup-like head rest part of the base plate. A set of hand holds is available to comfortably position the hands, arms and shoulders of the patient.